It all starts with a kick … and now you can offer the kick of Mtn Dew Kickstart on fountain! Originally released in 2013, Mtn Dew Kickstart continues to evolve with new flavors and energy intended for specific times of day. As successful as this product has been in the past, we expect the brand to continue to do great things now and in the future. Get on board! When Mtn Dew Kickstart was released in two flavors in 2013, the fruit punch and orange citrus-flavored beverages contained caffeine and electrolytes, which provide energy to start your day. 90% of Americans consume caffeine on a daily basis, and Kickstart was offered as an alternative to the coffee and tea sector. At 16oz, Energizing Fruit Punch Kickstart, for example has 80 calories, 5% juice, and 92mg of caffeine. Considered mid-calorie, Kickstart gave a nod to the healthier-conscious consumers still looking for a way to wake up. A year later, Mtn Dew Kickstart in Black Cherry and Limeade were introduced with the right blend of caffeine and electrolytes to fuel consumers’ evenings – think sports practice, marathon study sessions, and late night gaming. If it feels like coconut water is everywhere, that’s because it is. In the past decade, the potassium-packed drink has boomed into the billion-dollar industry it is. 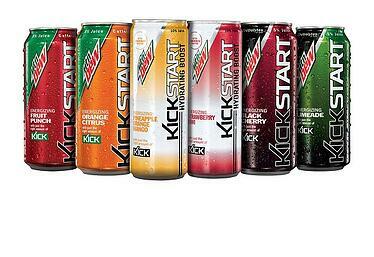 Mtn Dew was paying attention when they introduced yet another two new flavors of Kickstart earlier in 2015. Both Pineapple Orange Mango and Strawberry Kiwi contain coconut water, and the cans are sleeker, and lighter in a 12oz serving size. Hydrating boost is the beverage’s tagline and these varieties offer 10% juice, 60 calories, and 68mg of caffeine. Kickstart’s innovation isn’t stopping at the coconut water-infused beverages, as 2016 should see new flavors like Blood Orange, Watermelon, and Blueberry Pomegranate, which are likely to also boast not only coconut water, but antioxidants like vitamins C and E as well. The health conscious consumer should rejoice at these product releases and as ever, will remain loyal to Mtn Dew even if they aren’t cracking open a can of the bold, green original soda. Just as consumers have their distinct preferences when it comes to soda – diet Pepsi or regular, can or bottle, for example, there’s a swath of people who prefer fountain soda over prepackaged beverages. If people are avid ice fans, that need is met at fountain. There’s the perception, although unsubstantiated, that fountains are fresher because the soda syrup is carbonated on the spot as it’s being dispensed. Fountain drinks come with the implied value that you get more for your money. And, because people are creatures of habit, stopping in at a convenience store or micro market-type store to get soda seems more like an experience. Beginning this month, consumers are able to enjoy their Mtn Dew Kickstart in Orange Citrus on fountain. Not quite a soda, and not quite an energy drink, Kickstart has that sweet spot in the middle. The energy drink market as a whole is expected to grow 52% by the year 2019. Consumers will stay engaged with brands they like, tastes that stack up, and innovation that continues to engage them and grant them options. Get Mtn Dew Kickstart on fountain and give the people what they want!